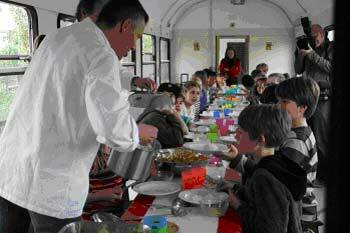 Children’s Kitchen - In the KIMBAexpress, a decommissioned and redeveloped railway car on the grounds of the Berlin Wholesale Market, school classes and children’s groups of up to twenty-five persons experience healthy nutrition up close. Together with the staff of Berliner Tafel e.V., fresh products from the Berlin Wholesale Market are processed, cooked and eaten in common. They also learn something about the products along the way. Since the fall of 2006, the Berliner Tafel has had its base at the Berlin wholesale Market. About one thousand tons of donated food are sorted at this location every month and then distributed to social facilities and community food programs throughout the city. A responsible, health-oriented approach to food products and beverages begins with the young. Parents and the social environment serve as living examples of what a healthy diet entails without taking the fun out of eating. The Berlin Wholesale Market feels it has a role to play here. What better place could there be than the Fresh Produce Centre for children and adolescents to find out more about good and healthy food. Children are our future.